Rep. Paul Ryan works on the 2015 budget at the Capitol in Washington in April. At rear is Austin Smythe, the Budget Committee staff director. House Budget Committee Chairman Paul Ryan unveiled a new anti-poverty reform plan Thursday titled “Expanding Opportunity in America.” The Wisconsin Republican’s multipronged proposal includes expanded tax credits, attacks on regulation and criminal justice reform. But the plan’s centerpiece is the “Opportunity Grant,” a rolling up of nearly a dozen federal anti-poverty programs into one holistic subsidy for states who chose to opt into the pilot program. The Opportunity Grant functions much like a block grant, when a fixed set of money is given to each state with loose guidelines from the federal government. A key contention against block grants is their response during an economic downturn — more people need help in a recession, but the block grant is fixed; it’s not countercyclical, to use the economic-y jargon. For example, take the two main programs in the current anti-poverty architecture that would be rolled into the Opportunity Grant: Temporary Assistance for Needy Families (TANF), in particular its cash assistance component, and the Supplemental Nutrition Assistance Program (SNAP), commonly known as food stamps. These two programs function in quite different ways, with TANF funds set at a fixed amount per state (based primarily on population). Such funds aren’t adjusted for inflation — and thus have declined in real value by about 30 percent, according to the Center on Budget and Policy Priorities (CBPP) — and fluctuate little in response to economic conditions. 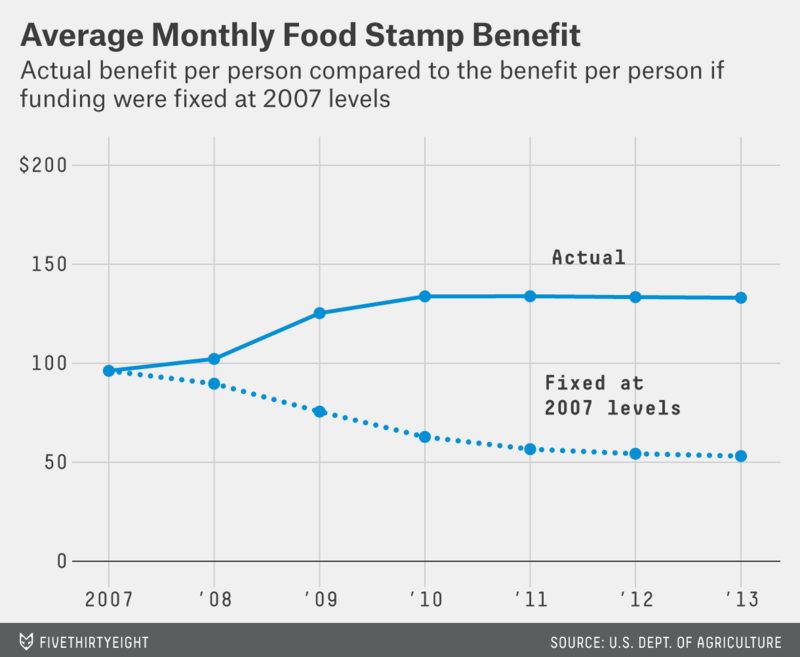 SNAP, or food stamps, is countercyclical. It rises as the economy worsens and declines as it improves. Since the end of 2003, SNAP expenditures have risen some 235 percent, up from about $23 billion to $79 billion in 2013. This is primarily in response to tough economic conditions, high unemployment and people leaving the labor force. 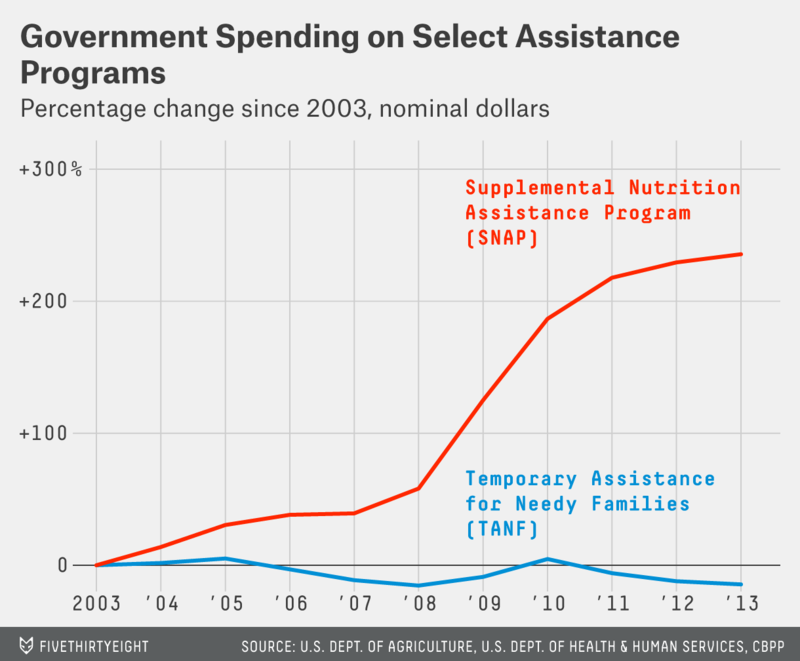 But TANF funds allotted for “basic assistance” — the kind of cash assistance most often labeled welfare — shows a decline of nearly 15 percent from its 2003 baseline (the data on TANF’s basic assistance was provided to FiveThirtyEight by the CBPP). And this is in nominal dollars; adjusting for inflation would make it look even steeper. Let’s imagine that Ryan’s Opportunity Grant pilot program was up and running during the most recent recession, which began in 2007. How much less SNAP assistance would have been available?